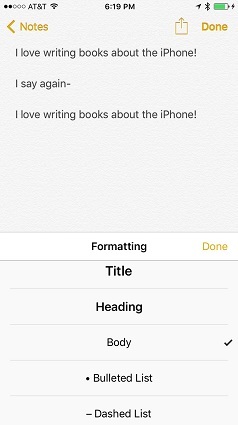 Text styles, including Title, Heading, Body, Bulleted List, Dashed List, and Numbered List, are available on the new shortcut toolbar on the iPhone. With a note open and the shortcut toolbar displayed, press on the text and choose Select or Select All. Tap the Text Style tool on the shortcut bar (labeled with Aa), then tap to choose a style on the list. Tap Done and the style is applied. Notes is a very nice application, but it’s limited. It offers no formatting tools beyond preset styles, Bold, Italic, and Underline, for example. So if you’ve made some notes and want to graduate to building a more robust document in a word processor, you have a couple of options. One way is to buy the Pages word-processor app for iPad, which costs about $10 and is free with a new iOS device, and copy your note. Alternatively, you can send the note to yourself in an email message or sync it to your computer. Open the email or note and copy and paste its text into a full-fledged word processor and you’re good to go.